As the Act of Uniformity of Elizabeth, which ought to have been printed as the first item of the Prayer Book, is frequently not so printed, it has led to the belief that the above rubric laid down the rule to be observed, and that the only question was, what was the proper construction of it? The Privy Council have, however, held that the law as to what are legal ornaments is not contained in it at all; but that it is no more than “a memorandum or note of reference to the law” as to ornaments which is contained in the Act of Uniformity (1 Eliz. c. 2), printed in all the legal copies of the Book of Common Prayer (see Ridsdale v. Clifton, L.R. 2 P.C. 276, at p. 324). To understand how this result was arrived at, it will be necessary to state the history of the Ornaments Rubric as it has been found by the Privy Council. The principle on which certain ornaments have been held to be legal and others illegal, will then be clear. The several kinds of ornaments may be dealt with in the following order: (1) Ornaments of the Church. Decorations are not ornaments as they are not things which are in use, or subsidiary to the service of the Church, but are things which are merely embellishments or architectural adornments. They are dealt with in this article partly because the law of ornaments is easier to understand if things which might be taken for such are discussed together. (2) Ornaments of the Minister. In what follows, the reader will bear in mind that what is attempted in this article is a resume of the law as to “ornaments” as laid down in the cases decided up to the present. The correctness of such decisions depends, first, on the historical accuracy and completeness with which the facts between Queen Elizabeth’s and Charles II.’s reigns have been brought before the Courts and found by them; secondly, on the correctness of the reasoning from such facts. Lord Cairns, in delivering the Judgment of the Privy Council in Ridsdale v. Clifton (L.R. 2 P.D. 276, at p. 307), pointed out that ritual suits were penal in form, and that a tribunal ought to be slow to exclude any fresh light which might be brought to bear on the subject; but said the Privy Council were “fully sensible of the importance of establishing and maintaining, as far as possible, a clear and unvarying interpretation of rules, the stringency and effect of which ought to be easily ascertained and understood by every clerk before his admission into Holy Orders.” The judgments, in their reasonings therefore, attempt to give such rules and principles; and their decisions and rulings must bind any conscientious and loyal member of the Church of England as by law established, until a case is brought where the parties succeed in inducing that Court to say that, owing to new light, it alters the rules as laid down previously. A lawyer can only express his opinion on the value of the reasoning on the facts as found by the tribunal. A historian may attack the correctness of the finding on which the reasoning is based, but it would be rash for either to predict to what extent a judgment would be upset and new rules laid down. “In the saying or singing of Matins and Evensong, Baptizing and Burying, the Minister, in parish churches and chapels annexed to the same, shall use a surplice. And in all cathedral churches and colleges, the Archdeacons, Deans, Provosts, Masters, Prebendaries, and Fellows, being Graduates, may use in the Quire, beside their surplices, such hoods as pertaineth to their several degrees which they have taken in any University within this realm. But in all other places, every Minister shall be at liberty to use any surplice or no. It is also seemly that Graduates when they do preach, should use such hood, as pertaineth to their several Degrees. The same book, in the first rubric at the end of the communion service, directs the English Litany to be said on Wednesdays and Fridays, and directs the priest on these days (after the Litany is ended) “to put upon him a plain albe or surplice, with a cope,” and to read that part of the communion service until after the offertory (although there is no one to communicate with him), and then to add one or two of the collects in the communion service, and to let the people depart with the usual blessing. The second year of Edward VI. is the year when his First Prayer Book was enacted by authority of Parliament. The 25th section has been held by the Privy Council to mean, not that the ornaments lawful at the time of the introduction of the Prayer Book were to be the standard, but the ornaments “prescribed by” the First Prayer Book. That section was clearly intended to have only temporary effect, since it speaks of the ornaments being “retained and being in use until other order.” The effect of this section was that while the Act made the Second Prayer Book of Edward VI. compulsory, the ornaments prescribed by the First Prayer Book were to be “retained and be in use until other order should be taken,” but it did not provide for or authorise the leaving out of the Prayer Book the rubric forbidding their use. This note was misleading, as it did not refer to the fact that the Act only directed that such ornaments should be “retained and be in use until other order;” but at the same time the note, on the face of it, showed that it professed to have no intrinsic authority, for it referred to the Act of Parliament “set in the beginning” of the book. And this is the view the Privy Council took. “Item. In the ministration of the Holy Communion in cathedral and collegiate churches, the principal minister shall use a cope, with Gospeller and Epistoler agreeably, and at all other prayers to be said at that Communion table to use no copes, but surplices. “Item. That the Dean and Prebendaries wear a surplice with a silk hood in the Quire, and when they preach ... to wear their hood. “Item. That every minister saying any public prayers, or ministering the sacraments (plural), or other rites of the Church, shall wear a comely surplice with sleeves, to be provided at the charges of the parish, and that the parish provide a decent table standing on a frame for the Communion table. “Item. They shall decently cover with carpet, silk, or other decent covering, and with a fair linnen cloth (at the time of the ministration) the Communion table, and to set the Ten Commandments upon the east wall over the said table. These directions having been made under the authority derived from the 25th section of Elizabeth’s Act of Uniformity, have statutory authority (Ridsdale v. Clifton, L.R. 2 P.D. 276, at p. 321). They have been copied almost verbatim into the 24th, 25th, 81st, and 82nd Canons, the first quoted of which refers to them expressly. In spite of this, those who wished to use the cope, alb, &c., argued that no “other order” had ever been taken, and that consequently such vestments were the only legal ones at the time of communion. The fact that from 1566 to 1840, over two hundred years, the vestments in question had never been used in parish churches and the cope only at exceptional seasons (see COPE) in cathedrals up to the time of the Commonwealth, and not revived after the Restoration, but universally discarded, weighing for nothing with them when seeking to interpret the rubric. In spite of the “other order” having been taken the rubric continued to be printed in the same form and with the same wording as it had before Queen Elizabeth’s Advertisements altered the law, until the time of the Restoration and the last Act of Uniformity. A correction not having been made either per incuriam, or because the law was well known, Queen Elizabeth s Advertisements were universally obeyed, in that no attempt was made by any one to use the alb or vestment at all, and the cope was worn only in cathedrals and collegiate churches. It was for the first time in 1662 by virtue of the Uniformity Act (but only in an altered form), that the “rubric” of 1559 as to ornaments which was put in without authority by those who published the Prayer Book obtained legislative sanction. When it was argued before the Privy Council that the present rubric repealed the Act of Elizabeth and the advertisements and canons, they held that was not so; first, because the Act of Elizabeth was specially confirmed by the Act of Uniformity of 1662. Next, because the universal practice, from the time of the passing of the Act until the beginning of the modern Oxford Movement, showed that no one considered that the rubric altered the universally enforced rule from 1566 to 1662 (leaving out the time of the Rebellion) of abolishing the alb and other vestments in parish churches. The Privy Council held therefore that the present rubric, if it was not in conformity with the statute of Elizabeth as amended by the “other order” contained in the advertisements of 1566, was not otherwise than what it had been before, a memorandum of reference to that law (Ridsdale v. Clifton, 2 P.D. at p. 324). Elizabeth’s Act of Uniformity was specially subscribed and adopted by Convocation. The Elizabethan Act was also incorporated into the Prayer Book, and made part of its contents No. 1. The Ornaments of the Church.—We will now see what ornaments of the Church are mentioned in the Prayer Book of 1549, the first one of Edward VI. They are: An English Bible, the new Prayer Book, a poor men’s box, a paten, bell, chalice, a corporas, an altar, pulpit, font. There are some others implied in it by ceremonies which have been abolished, such as a vessel for anointing oil, but it cannot be fairly contended that the “ornament” remains after its use has been abolished. The result of these directions has been held to be that stone altars are illegal in the Church of England, and that wooden movable tables are the proper ornament (Faulkner v. Litchfield, 1 Robertson Eccl. Report, 184 ; Westerton v. Liddell, Moore, Sp. Report, p. 185). In Westerton v. Liddell it was also held that as there was no direction as to the colour of the “carpet,” any colour might be used. This did not apply to the fair white linen cloth. As to that, it was held it must not have an embroidered or lace border. Prima facie two communion tables are not lawful in one church, but if part of a church is separated from the rest, and is used when there are small attendances, it has been allowed (re Holy Trinity, Stroud Green, 12 P.D. 199). Bells.—A bell is mentioned in the last paragraph of the Preface concerning the service of the Church (and in the Commination Service in the First and Second Prayer Books, but not in that finally adopted), and in Canons 15, 17, 80, and 111. 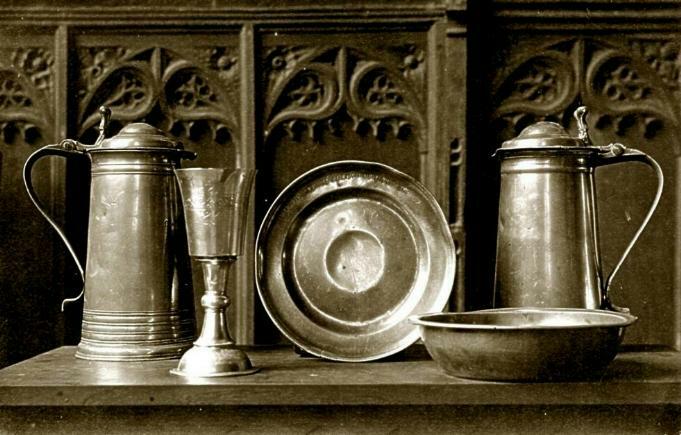 Alms Bason.—Directed by the rubric in the communion service to be a “decent bason.” In the First and Second Prayer Books a poor man’s box is mentioned. The Prayer Book of 1662 omits all reference to it, but it is mentioned in the 84th Canon under the name of Alms-chest. Register of Christenings, Weddings and Burials.—Ordered by Canon 70 to be of parchment, to be kept in one sure coffer with three locks and keys, one to remain with the minister, and the other two with the churchwardens severally. This book shall not be taken out except in presence of the minister and churchwardens. The register must now, by 19 & 20 Vict. c. 119, be kept in an iron chest. It should be noted that the Registration Acts to some extent supersede this Canon. Homilies, Book of.—Ordered by the 80th Canon. The above is a list of all the ornaments directed by law to be used. Mr. Justice Phillimore, in the 2nd edition of the late Sir Robert Phillimore’s Ecclesiastical Law, has a long list of others, and as an authority for their use he gives Lindwood. Lindwood was Bishop of St. David’s in pre-Reformation times, namely in Henry VI.’s reign, and a canon lawyer. He wrote a book discussing how far the English provincial constitutions were valid, testing their validity by examining whether they agreed with, or contravened, the Roman Canon Law. It is needless to say that this writer is not recognised by the English Courts as an authority as to what ornaments are lawful since the Reformation. (The only ornaments that have been held lawful are things consistent with the rubric, and subsidiary to the prescribed service). In discussing how far ornaments are legal the Courts have taken notice of former rubrics on the subject, and where a former rubric prescribed the use of a certain ornament, and that ornament has been omitted from the later one, they have held such ornament illegal. Most of the decisions deal with vestments, but this principle of construction has been applied to ambiguous rubrics (see, for example of an instance, the way in which the words “it shall suffice” were construed in Hebbert v. Purchas, 3 P.O. 605, in discussing whether wafers are legal. See also Martin v. Mackonochie, L.R. 2 P.C. 365, at p. 390). The Privy Council in Westerton v. Liddell (Moore’s Sp. Report, at p. 187), after saying they “entirely agree with the opinions expressed by the learned judges in these cases (i.e. Westerton v. Liddell and Beal v. Liddell) and in Faulkner v. Litchfield (1 Rob. Ecc. Rep. 184), that in the performance of the services, rites, and ceremonies ordered by the Prayer Book, the directions contained in it must be strictly observed, that no omission and no addition can be permitted,” said that they were not prepared to hold that the use of all articles not expressly mentioned in the rubric, although quite consistent with, and even subsidiary to, the service, is forbidden. They pointed out that organs, pews, cushions, pulpit-cloths, seats by the communion table, were permissible. On this basis they dealt with the question whether a credence table was permissible, and held it to be so. And this view the Privy Council held to be right in Martin v. Mackonochie (L.R. 2 P.C. 365, at p. 390). Illegal Ornaments of the Church. Bearing in mind the definition of ornament “a thing used in the services and ministrations of the Church”–it will be seen that on the principles laid down in the cases cited, all ornaments not prescribed by the First Prayer Book of Edward VI., the rubrics and the canons (which are to be read together with the former), are illegal unless it can be proved that they are quite consistent with, and subsidiary to, the prescribed service. Thus, a cross used as an ornament and carried about is illegal, and, a fortiori, a crucifix (Elphinstone v. Purchas, 3 Ad. & Eccl. 67). Holy water stoups, on the same principle, were held illegal in Davey v. Hinde, 1901, p. 95, and ordered to be removed. We will now give a list of some ornaments which have been held to be illegal. Baldacchino, or canopy over the communion table. This, at first sight, would appear not to be an ornament, as incapable of use, but it has been held that as it was used for the purpose of protecting the host when exposed for worship, and for the honour of the blessed sacrament, it was an ornament and illegal. The Prayer Book forbids the elevation or showing of the sacrament, and a baldacchino was inconsistent with the service prescribed therein. Confessional Boxes.—Bradford v. Fry, 1878, 4 P.D. 93; Davey v. Hinde, 1901, p. 95. Stations of the Cross.—Ridsdale v. Clifton, 2 P.D. 316; Davey v. Hinde, 1901, p. 95. Tabernacle.—Davey v. Hinde, 1901, p. 95; Kensit v. St. Ethelburga, 1900, p. 80. Images representing the Virgin Mary, the Good Shepherd, the same case. Decorations have been defined in Martin v. Mackonochie (2 P.C. 364, at p. 387) to be “things inert and unused,” and were distinguished from ornaments which have an “active use ... as part of the administration of a ceremony.” Decorations are of two kinds things, like decorative patterns, which are incapable of use. Next, things which though inert, can be used. These, as long as they are not used, are treated as decorations. There is often considerable controversy as to whether a “usable” thing is an “ornament” or a “decoration.” Thus, one picture might be an “ornament” if used for a religious purpose, or as an aid to prayer, and another, of a historical scene, would only be a “decoration.” For example a cross, the rule has been to allow them if not used, or put up in a place where they lead to misconceptions. Thus, a cross is not allowed in connection, or apparent connection, with the communion table, for it must not be given the appearance of an altar. The judgment of the Privy Council in Liddell v. Beal (Moore s Sp. Rep.), in dealing with a case where a wooden cross had been put upon a narrow ledge “raised above the rest of the table” (see p. 151), the ledge being attached to the table (p. 186), contains the following conclusions: “The distinction between an altar and a table is in itself essential, and the circumstances, therefore, which constitute the distinction, however trifling in themselves, are for that reason important.” The cross was therefore ordered to be removed from the table so that it should not look like an altar. The existence of a cross attached to the table was said to be neither consistent with the letter nor the spirit of the canons. In consequence the cross was removed to the sill of the east window, which was five feet ten inches away from the communion table. This did not satisfy some of those who objected to the cross, and they took further proceedings (Liddell v. Beal, I860, 14 Moore P.O. 1). The Privy Council then held that the cross was not “in any sense in communication or contact with the communion table,” and that the monition in that case had not been disobeyed. In Durst v. Masters (1876, 1 P.D. 373) the incumbent put a cross on a ledge a quarter of an inch above the table, and asserted that it was legal in such a position and was movable. The Privy Council however, refused to enter into any such refinements as to its being movable and a quarter of an inch away from the table, and said that to the eye of a stranger coming into the church there was no difference from what had been originally condemned in Liddell v. Westerton; and laid down the principle that no cross should be placed in such a position as to be in apparent connection with the communion table. The Privy Council in Phillpotts v. Boyd (L.R. 6 P.C. 435) allowed a marble reredos at Exeter Cathedral, having on it a bas-relief carving which represented the Ascension, Transfiguration, and the Descent of the Holy Ghost as historical scenes. The Privy Council allowed this reredos on the ground that it could not become an object of superstitious reverence. Courts judge on the evidence presented before them as to the likelihood of any decoration or figure becoming an object of superstition. Thus, the figures in relief on the reredos at Exeter were held subsidiary to the representation of the events, and so were permitted as unlikely to lead to superstition. It is not sufficient that a figure might be, it must be likely to be, or probably would be, a cause of superstitious reverence; thus, a bas-relief of the crucifixion scene on a reredos was held not likely to be a cause of superstition in Hughes v. Edwards (1877, 2 P.D. 361), and the Bishop of London, exercising his discretion in R. v. Bishop of London (24 Q.B.D. 213), refused to sanction proceedings in the case of the reredos of St. Paul’s Cathedral, on the ground that he thought it would not be a cause of superstition. By the words “superstitious reverence,” “adoration,” or “worship,” the Courts do not only mean to convey the limited idea of a figure or object itself worshipped like a pagan idol, but to embrace the far more extended conception of worship, adoration, or reverence paid to the Deity in presence of, or before, and through the medium of, those objects or figures, and referred to the Roman Catholic doctrine as laid down by the Council of Trent, Sess. xxv., De Invocatione veneratione et reliquiis sanctorum ct sacris imaginibus. It is this kind of worship which the XXIInd Article of Religion repudiated, and declared to be “a fond thing vainly invented.” The principle on which the Courts go is that the best forecast as to whether a thing is in danger of being an object of superstitious reverence, especially in those cases where the weaknesses and failings of mankind are concerned, is to be obtained from the experience of the past. Thus, as the worship of the crucifix on the rood screen was enjoined in the Missal according to the Sarum Use, such a crucifix was clearly liable to abuse. Lord Penzance laid down the rule in the following words in Clifton v. Ridsdale (1876, 1 P.D. 316, at p. 356), which were quoted and approved of by the Privy Council on appeal (1877, 2 P.D. 276): “When the Court is dealing with a well-known sacred object an object enjoined and put up by authority in all the churches in England before the Reformation in a particular part of the church, and for the purpose of adoration when the Court finds the same object, both in the church and out of it, is still worshipped by those who adhere to the unreformed Romish faith, and when it is told that now after a lapse of three hundred years it is suddenly proposed to set up the same object in the same part of the church as an architectural ornament only it is hard not to distrust the use to which it may be put, or escape the apprehension that what begins in decoration may end in idolatry.” If this apprehension is a just and reasonable one, then there exists that likelihood and danger of superstitious reverence which the Privy Council, in Phillpotts v. Boyd (1875, L.R. 6 P.C. 435), pronounced to be fatal to the lawfulness of all images and figures set up in a church. Sir A. Charles, the late Dean of the Arches, held in re St. Anselm, Pinner, 1901, p. 202, that the question whether a particular decoration was in danger of superstitious reverence depended on the probability considering the circumstances of the particular church, and suggested evidence being adduced as to the nature of the services in the church where it was proposed to put up on a chancel screen a crucifix with figures of the Virgin Mary and St. John on either side. When he was satisfied as to the nature of the services, he allowed those figures to be put up. It is submitted that the principle of this decision is not correct a new vicar might commence all the superstitious practices forbidden and that the principle laid down by Lord Penzance is a more satisfactory one, viz., that when the particular thing has been associated, and still is, with a practice the Church of England holds superstitious, it cannot be permitted. Gates to chancel screens have not been approved of by the different chancellors, as appearing to make a distinction between the chancel and the rest of the church, which is not recognised by law; yet they have been allowed for protection of church property where it was customary to keep the church open all week days, and on condition that they should be kept open during the services (Rector of St. Andrew s, Romford v. All Persons having Interest, 1894, P.D. 220). Flowers, if used only as decorations, are legal (Elphinstone v. Purchas, L.R. 3 P.O. 605). As to things forbidden because used ceremonially, see CEREMONIES. Ornaments of the Minister.—The reader who has followed the introductory history has seen that the Privy Council have held that the lawful ornaments for a minister are those authorized by the Advertisements of Queen Elizabeth, and that these Advertisements have not been superseded by the Ornaments Rubric. The consequence is that the surplice is the only lawful ornament to be worn in parish churches while ministering, unless, perhaps, the scarf or tippet, and hood in addition. Tippet or Scarf, and Hood.—The Advertisements direct Deans, Masters of Colleges, Archdeacons, other Dignitaries in Cathedral Churches, Doctors, Masters of Arts, Batchelors (sic) of Divinity, Medicine, and Law, having ecclesiastical living, inter alia to wear in their common apparel abroad tippets of sarcenet. The 74th Canon directs for the same persons hoods and tippets of silk or sarcenet, and square caps. All other ministers “admitted or to be admitted,” are to wear the same dress as the others, except tippets. The tippet has become part of the dress worn by ministers, though it is clear both from the Advertisements and Canon that it was an outdoor dress and originally worn by dignitaries in Colleges and Cathedrals, and Doctors and Bachelors of Theology, Law, and Medicine. It has never been the subject of any judicial decision. The scarf is to be distinguished from a stole. A stole is a narrow strip of coloured silk expanded at the ends and reaching down to the knees. A tippet, or scarf, was of folded black silk going down to the ankles. thought it could be innocently carried in the hand. The black gown has been held to be legal for two reasons: first, because the surplice has been only directed to be worn during the administration of the Holy Communion and the other rites (rite being “a service expressed in words,” Martin v. Mackonochie, 2 Ad. & Eccl. 116, at p. 136) of the Church, and preaching is not a rite nor ministration within the rubric; secondly, the Court held that the use of the black gown had been legal all along through three centuries, and that if it had not been so, on the principle that communis error facit legem, i.e. since there has been a continuous use of such gown for three hundred years, such use would make it legal even if it had not been so originally (Wright v. Tugwell, 1897, 1 Ch. 85). Ornaments of a Bishop.—The bishop is ordered by the rubric in the consecration of a bishop to wear a rochet. With this they wear a chimere, which was an upper robe originally worn out of doors, and since Queen Elizabeth’s time made of black satin. Pastoral Staff.—If we apply the method of interpreting the rubrics which has been laid down by the Courts, and which is explained on a previous page of this article, it will be clear that the pastoral staff is an illegal ornament. The First Prayer Book of Edward VI. Enjoined it in the “certain notes” at the end, where vestments are dealt with; the Second Prayer Book and the present one have omitted all reference to it. In the “certain notes” at the end of the First Prayer Book the bishop was directed to hold it in his hand, or have it borne for him by his chaplain, both at Holy Communion and when executing any other public ministration. The Ordinal of 1550, in the service of consecrating bishops, also directed both the consecrating bishops to have their pastoral staves in their hands, and, as part of the ceremony of consecrating a new bishop, in the middle of the exhortation, after he is given the Bible with the words, “Give heed unto reading,” directs the archbishop while saying the words, “Be to the flock of Christ a shepherd,” to put a pastoral staff into the new bishop’s hands. All these references to a pastoral staff have been cut out of the present Prayer Book and Ordinal. This view is borne out by Gibson, who, in his Codex published in 1761, says at p. 118, referring to the pastoral staff, episcopal ring, mitre, and gloves (all enjoined in the Roman Pontifical): “All which, and many other superstitions of like nature (as savouring more of the ceremonies of the Jewish, than of the simplicity of the Christian religion), our Reformed Church hath prudently and piously laid aside in the consecration of her archbishops and bishops, retaining only such outward tokens as are most ancient and most grave.” And it may be noted that at the first Elizabethan consecration of a bishop, viz., Archbishop Parker’s (of which he took care there should be a very exact account in his Register), no pastoral staff was given, as is expressly mentioned in the Archiepiscopal Register. No current legal authority in England nor any reputable scholar of the Book of Common Prayer would accept such an interpretation. The Book of Common Prayer has to be reauthorized at the accession of every monarch and the legal rule is that the latest act passed is the law. The rubric means entirely what it says and the current usage in the majority of English cathedrals is evidence of the same. I can't say I have been in all of them, but all I have been in have used the traditional vestments and a quick run around the great choir in York with its statues of previous archbishops which contain their actual croziers would show that such were in use from the restoration onward.